CARRYING four persons and a sewing machine, the world’s weirdest bicycle recently had a tryout in Chicago, Ill. 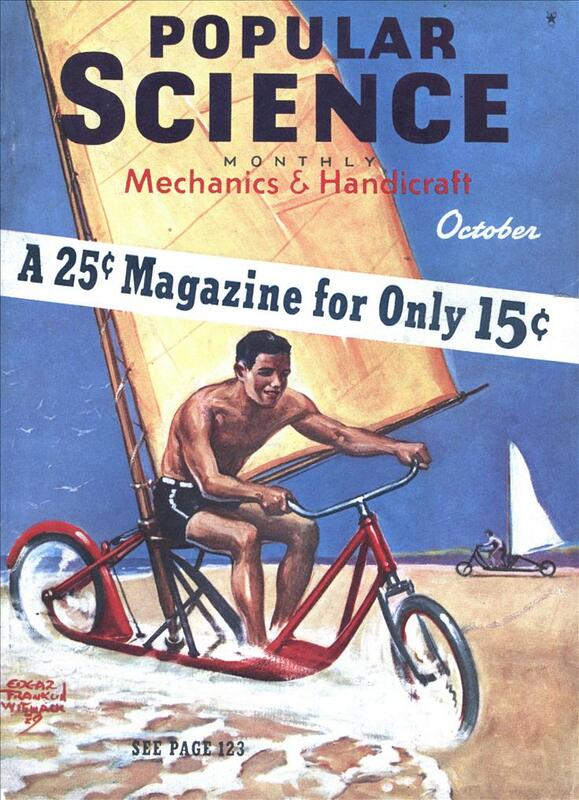 The two-story vehicle, known as the “Goofybike,” is the creation of Charles Steinlauf. It carries the whole Steinlauf family. The inventor rides at the top and guides the contraption by means of a huge automobile steering wheel. 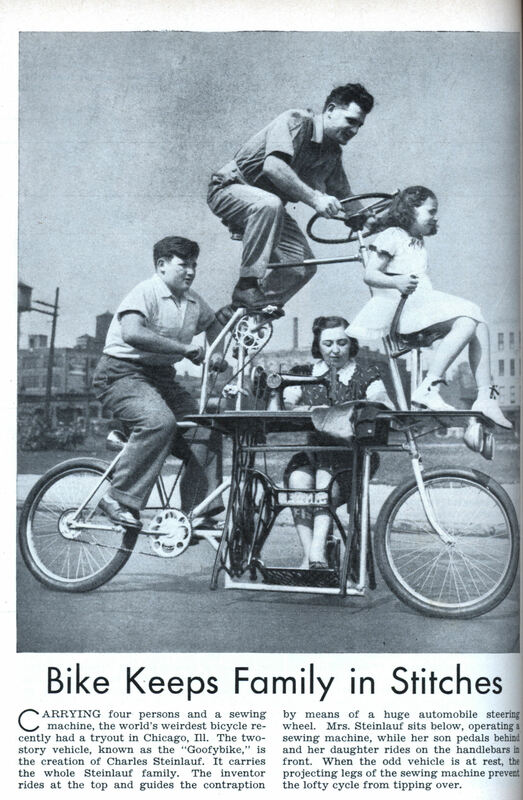 Mrs. Steinlauf sits below, operating a sewing machine, while her son pedals behind and her daughter rides on the handlebars in front. When the odd vehicle is at rest, the projecting legs of the sewing machine prevent the lofty cycle from tipping over. it looks like a reenactment of the aristocrats! I’m most impressed that the wheels and tires can hold that up. In stitches, bandages and casts. The center of gravity looks way off. Wouldn’t mom’s weight pull the bike to its left? It looks like the boy could use some more time on the bike. What was with these all these “wacky” stories in the 1930s? Sure, times were tough and people were looking for diversions but heaps of them were just pointless and stupid like this. What’s the significance of mum doing sewing? Poland was being crushed under the Nazi jackboot while this issue was being prepared and we get the zany Steinlaufs? Joey Oâ€™Neill: Gotta fill the pages somehow. @StanFlouride — the sewing machine with the cast iron tredle-power and table probably weighs about the same as she does. Now that’s what I call a sweatshop! Eat your eat out >insert pretty much any sports shoe manufacturer here<! in that case, BB, hats off to the person who also photoshopped the youtube vid. maybe they just got a job lot of pixels for cheap and decided to use them up. 14: You are a Genius! You’re the first person to realize that I actually created all 4,852 posts in Photoshop. LOL…kinda like a sweat shop using family members. Are their Steinlauf descendants in Chicago still and are they still making freakbikes? see comment 12 is that it? My wife’s grandfather was one of the Steinlauf bike brothers. Would love to know where they are today! @Joey O’Neil we’ve often asked ourselves the same question. I was glad I asked and I’m glad you asked too. All the the Steinlauf bike brothers were born in Tiktin, Poland. They were using proceeds from their zany bikes to try and bring over their family from clutches of the Nazis. They frequently sent money, clothing, and other much needed supplies to their family that were eventually murdered by the Nazis. You would be heartbroken to see the letters that we still have that relatives trapped in Nazi occupied Poland sent pleading for help.